Summertime is here and it’s the perfect time to entertain outdoors! One of my favorite places to entertain in my home is my outdoor back patio. I have set up my patio as an outdoor living room with a furniture set, outdoor rugs, and a separate dining area. My house overlooks the golf course so there is always a nice breeze coming off the golf course and it’s so entertaining to watch all the golfers. 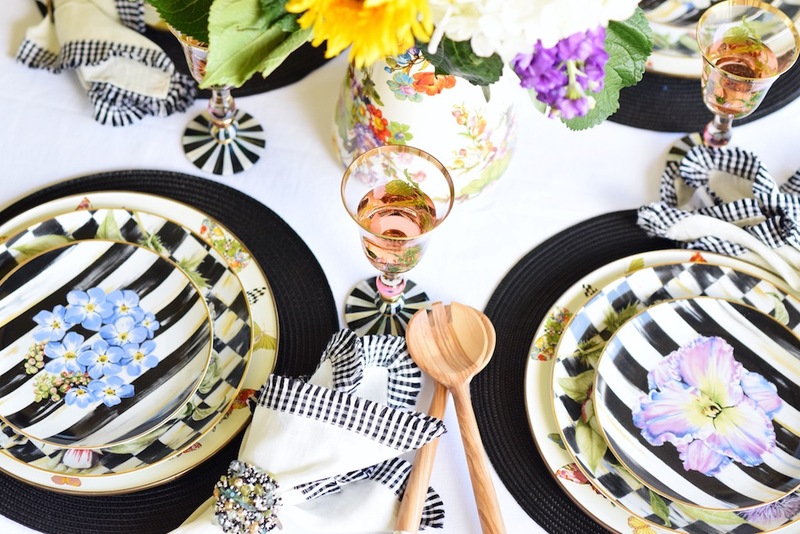 One of my favorite brands to use when entertaining during the summertime is MacKenzie-Childs. 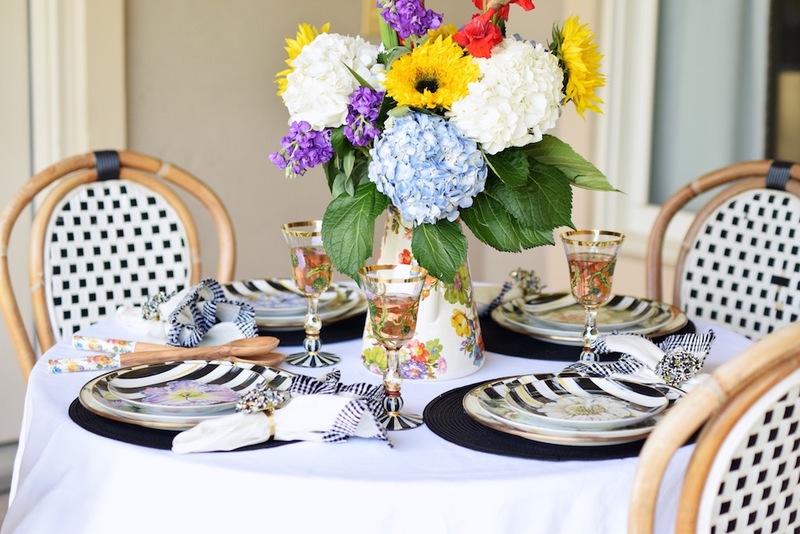 I love combining several of their patterns for a festive outdoor tablescape. 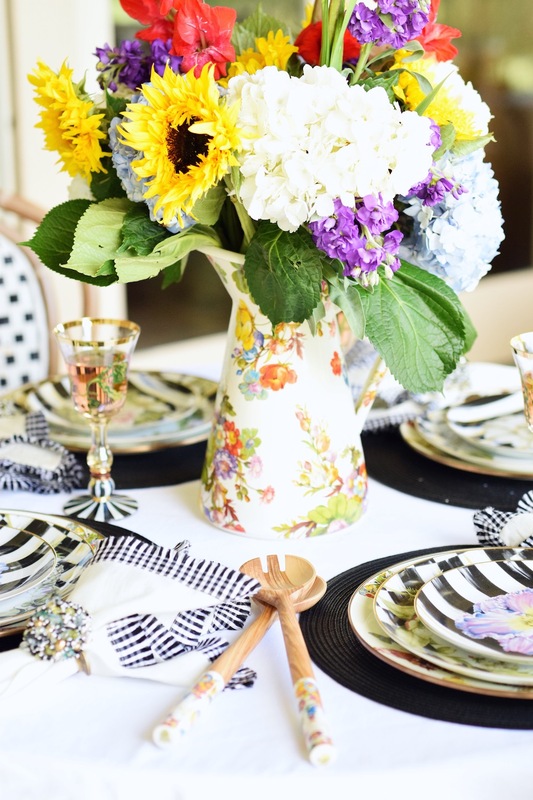 In today’s post combined the Thistle & Bee Dinnerware Collection along with these Butterfly Garden Charger plates and this Flower Market Pitcher. 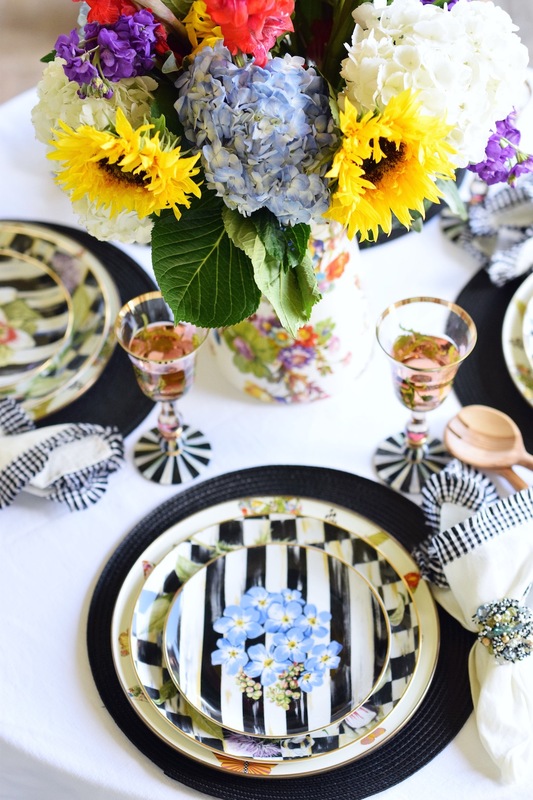 A tablescape is not complete without a grand centerpiece. The centerpiece in today’s post is one of the largest I have put together. 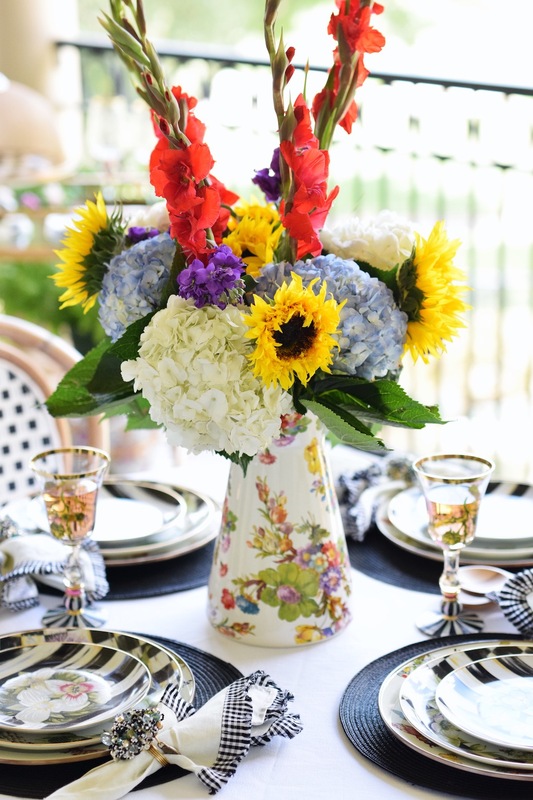 I used the large MacKenzie-Childs Flower Market Practical Pitcher and filled it with a variety of flowers from blue hydrangeas, white hydrangeas, sunflowers, and several others! 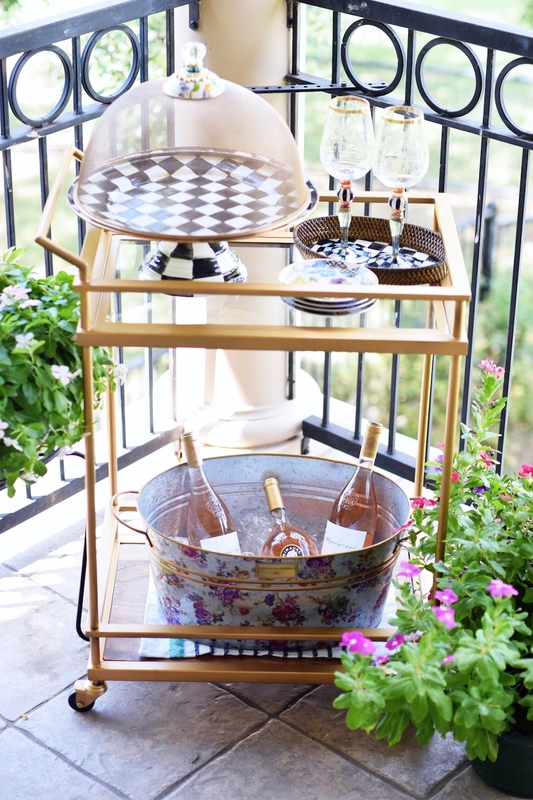 I just love putting together a bar cart for outdoor entertaining. 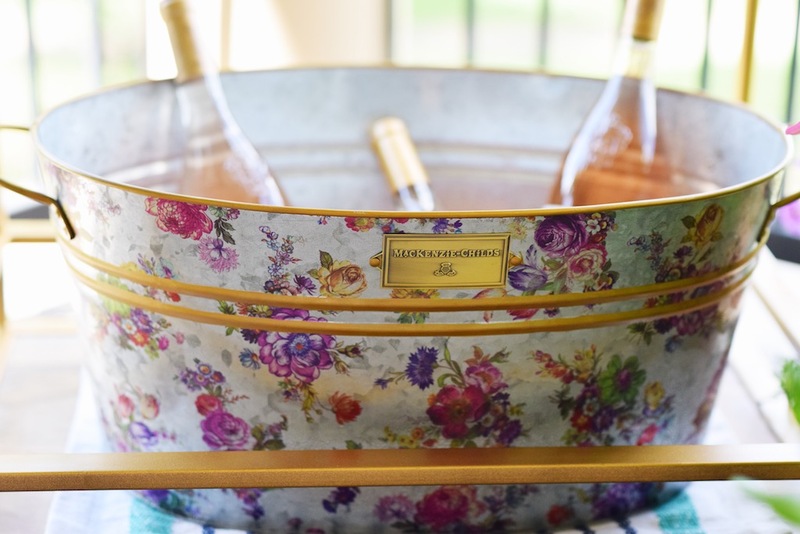 One of my favorite pieces featured on this bar cart is this Flower Market Beverage Bucket, you can fill it with your favorite summertime beverages of choice. 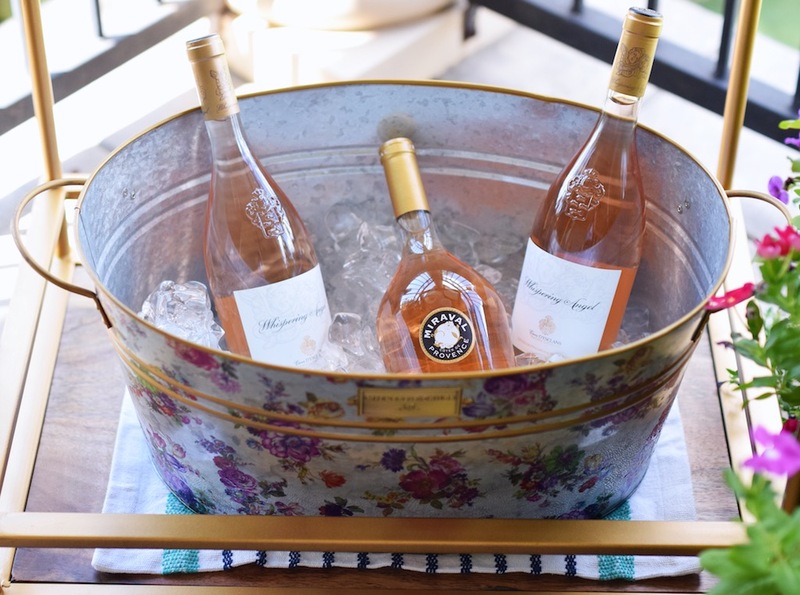 If you can not tell Rosé is definitely my go-to drink! 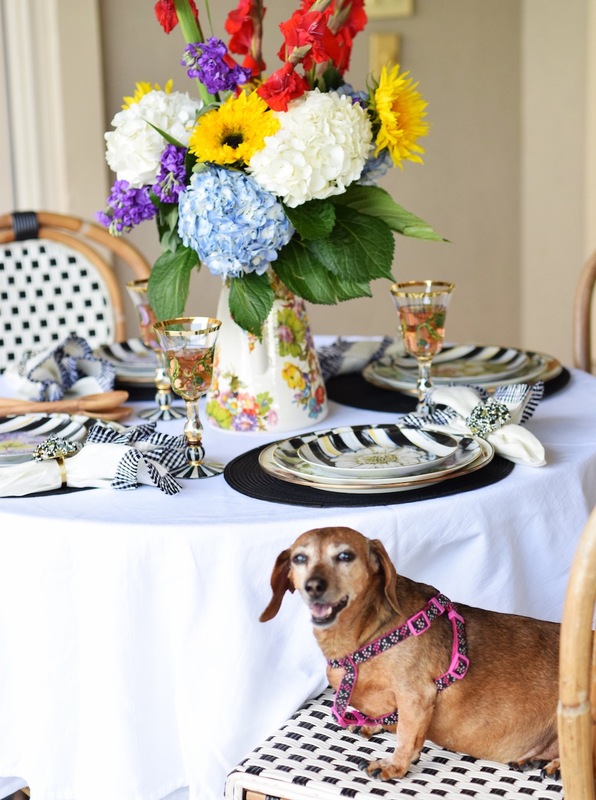 Another must-have piece for dining outdoors is this Flower Market Mesh Dome. 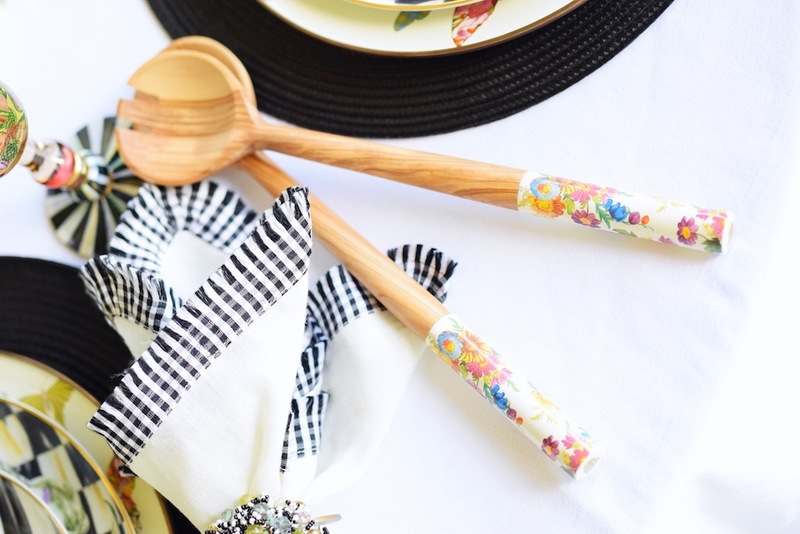 This piece is perfect for keeping those pesky bugs off of your food. 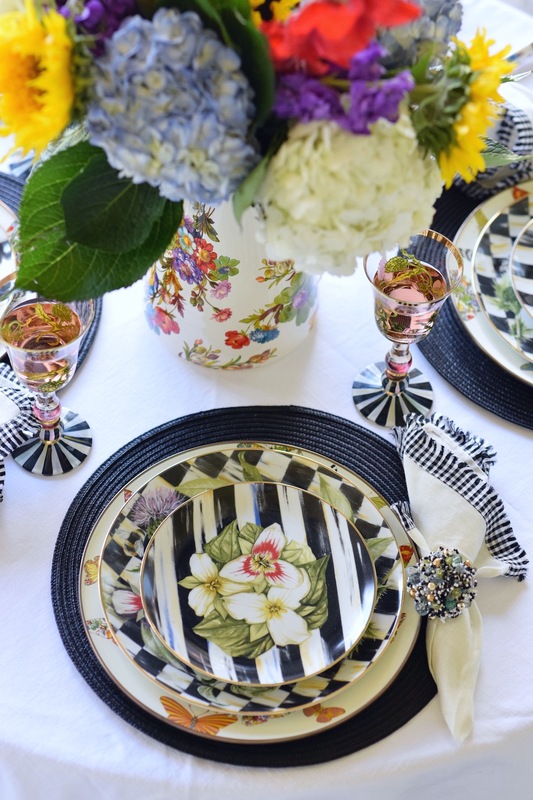 It can be easily placed over a Courtly Check Enamel Pedestal Platter as pictured here. 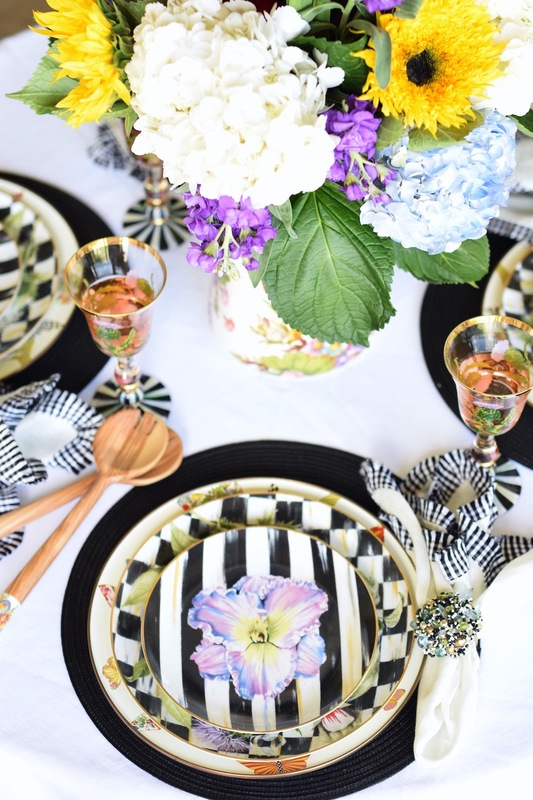 I look forward to entertaining with this festive tablescape and bar cart set up through the rest of the summer! 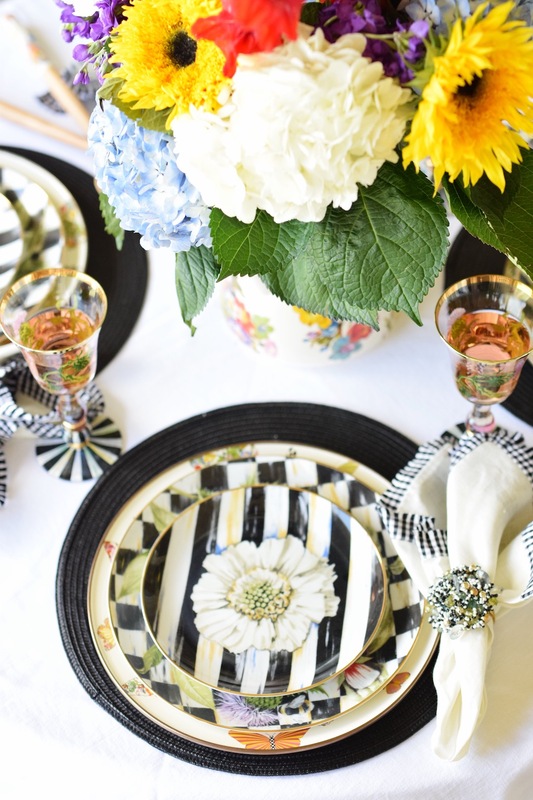 Thank you MacKenzie-Childs for these fabulous pieces for entertaining!